Join Lanka LIving Surf in a surf camp in Ahangama, Sri Lanka. Here, surfers of any level will be able to refresh themselves and have access to beautiful warm water. Ahangama has been considered a little slice of paradise by some, the same can be said about the villa, waves, and surroundings. Whether you are a beginner or intermediate surfer, the waves are always ready for you! Lanka Living in South West and Sri Lanka's freshest surf camp. Nestled in the jungle treetops of Ahangama just minutes away from amazing warm water waves; their jungle villa has something for everyone. They have two beautiful luxury private rooms: one with air-conditioning and one with an upstairs balcony and a large private bathroom. Two standard private double rooms and a colorful, spacious globetrotter dorm. It’s important to have somewhere comfy to chill after a big surf sesh which is why they’ve made as many chill areas as they can. Their favorite being the biggest comfiest hammock in Sri Lanka (they’ve tested it and it can fit 20 people). They understand everyone is an individual and embrace that! Surfitness is something Lanka Living Surf is proud of being the first and only to offer in Sri Lanka or in the world for that matter. It’s fitness related exercises that will increase your power, health, and make you stronger. It will help you develop faster and catch more waves and will reduce the risk of getting injured. Lanka Living Surf embraces people’s differences and backgrounds; they analyze, adapt, and provide each and every one of the ultimate exercise that suits you best. This is a solution that will increase each of your ability to catch waves in an easier and safe way, become strong and a good surfer while having fun. This is a way for you who don’t live next to the sea and have the opportunity to surf every day to keep that muscle memory fresh, the paddle strong, and the popup technique perfect. So, when you are ready to rip for next time, let's skip these heavy struggling first days with weeks of aching pain. At the end of your stay, you will receive a form of exercises special made for you to keep in shape or to level up for next stay with Lanka Living Surf. You can find Lanka Living Surf’s hidden gem along Sri Lanka’s coastline, in the southwest to be more specific. Whether you are looking to improve your surfing or are simply a beginner, the wonderful waves along the coast suits all competence levels. Lanka Living Surf is spoiled with more than 15 amazing breaks around them, within five to 15 minutes’ tuk-tuk ride. The following schedule is very flexible and Lanka Living Surf can customize your stay to you. This surf camp will take place in Ahangama, Sri Lanka. In Sri Lanka, winds are offshore making clean waves, swells are consistently good, and rain is at a minimum. 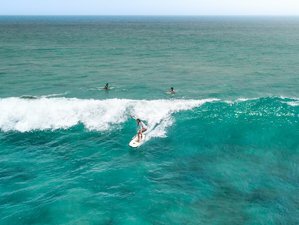 With tropical temperatures all-year-round and perfect waves nearly every day during the season (November-April), Sri Lanka offers ideal conditions for beginner, intermediate, and advanced surfers. Dinners are served in the camp and you will eat out two times a week. You join Lanka Living Surf if they arrange something or go wherever you like - Lanka Living Surf has lots of good recommendations. During free time, you are free to explore the area (Lanka Living Surf can help arrange trips and activities), chill in one of Lanka Living Surf’s many jungle chillout areas, play games, go to the beach or pool nearby, or whatever you feel like doing. After your daily activities, you can join Lanka Living Surf if they arrange something or go wherever you like - Lanka Living Surf has lots of good recommendations. After dinner, they can take you to the best party in the area for the night, but not before some pre-drinks in their giant hammock! Otherwise, you will have something planned or you are welcome to chill in the camp or do whatever you like. On certain days, Lanka Living Surf plans special activities for you, such as a boat party on Friday and a day surf road trip on Sundays. Lanka Living Surf has several cooperations with the locals in Sri Lanka, supporting them and letting them do what they do best. This allows Lanka Living Surf to offer you the ultimate in trips with a safe tour guide that speaks good English, gives you a good deal and won’t rip you off. Lanka Living Surf has plenty of options for you to choose between whether you’re keen on a small journey to one of the local tea plantations, mount Adams Peak or visit Sri Lanka's famous natural attraction Sigiriya Rock. Please book your flight to arrive at Bandaranaike International Airport (CMB). Transfer from and to this airport is available upon request. The distance from Bandaranaike International Airport (CMB) to Ahangama is about 135 kilometers. It is highly recommended that you take airport transfer option, which is by far the fastest and smoothest way of getting there. The transfer will cost 100 USD and will take up to four people / taxi. You will be in the camp around three hours after pickup. Lanka Living Surf can easily arrange this on request. The prices below have a discount of 20%. To benefit, book and reserve before April 9, 2019.